Bingo Extra Offers | Get Your 100% Match Bonus Here! Claim Offer – Get Your 100% Match Bonus Here! Bingo Extra was launched in 2016 and currently offers new players a choice of either a 100% bingo bonus or 100% added slots bonus – you decide! What do we recommend? Well, it really is up to you. If you prefer playing slots, go with that. If you like bingo games more, well there is your answer! One thing is for sure, you will be provided with brilliant value and a great chance of winning some real cash prizes. Please remember, terms and conditions apply to all offers. So make sure you read them before depositing using any of your hard earned cash. Get 20% Bonus Back every Wednesday. Huge, potentially life-changing progressive slots jackpots. At Bingo Extra you will find a superb variety of 75 ball, 90 ball and 5-line bingo. There are plenty of pre-buy rooms too, where you can purchase tickets for upcoming big jackpot games. Remember, you don’t have to be present for these games, so if you buy tickets and miss the game, you could be sitting on a nice little jackpot when you check out your account the next day. As far as bingo jackpots go, you will want to check out Everyone’s a Winner, the £100 weekly shop (win shopping vouchers) and Win-Back Wednesday with a £200 jackpot. However, where the really life-changing prizes are found, is in the slots jackpot. At the time of writing, there are several games with progressive jackpot prizes well over £100,000. Definitely, make sure you check out the Grease Lightnight Jackpot game! Like most reputable online bingo sites, you can deposit using your credit or debit card. There are also other payment options, including PayPal, Paysafecard and Neteller. Here at MyTownBingo we are big fans of PayPal as it gives you an extra layer of security between yourself and the site. However, we fully endorse Bingo Extra and consider it a safe place to play, especially since they are regulated by the UK Gambling Commission. 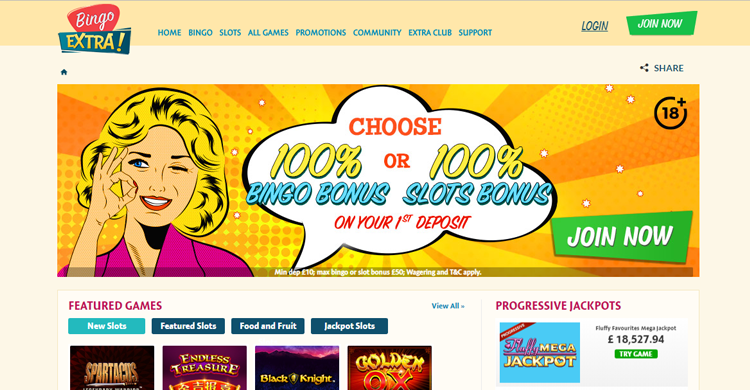 If you are looking for a new bingo site to play at, with fantastic value, Bingo Extra is our number one pick. Not only is it cheap to get started. You will gain access to some massively huge jackpot games, where unlike a lot of bingo sites, you could literally win a totally life-changing prize. So why not get started? You will be eligible for either a large 100% bingo bonus, or a rewarding 100% slots bonus. Either way, you will get loads of extra funds to go after some big jackpot prizes. So why not let your hair down, and have some free fun playing bingo now!